Guns ‘N’ Roses, America’s bad boys of hard rock who will perform in Auckland on Monday night, are a bunch of rowdy, raunchy, gut-level rockers who live on the streets of Hollywood and put their experience to music. Members of the band Duff “Rose” McKagan, Slash, W Axl Rose, Steven Adler and Izzy Stradlin admit that tension is part of their daily lifestyle. From the confinement of dressing rooms to the luxury of hotel rooms “mood swings” can happen at any time resulting in bottle of vodka being thrwon from wall to wall as tempers explode. Somehow, their tension, which forces lead singer Axl to travel separately to and from concerts to avoid friction, spills over into their music. And It’ s the Gunners’ rebel lious music that in October, shot them to the top of the Billboards album and single chart. 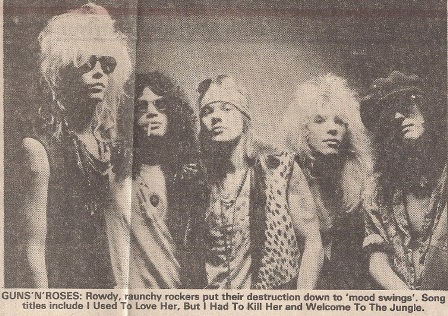 The album Appetite For De struction was originally released in July last year, along with their single Welcome To The Jungle, but both were rejected by American radio stations and MTV becouse they felt the Gunners’ music was too hard. Young people, however, began to buy the album and Guns ‘N’ Roses began to support bands in- cluding Alice Cooper, The Cult, Motley Crue and Aerosmith. Within a few months MTV started to change its mind and Welcome To The Jungle dominated music television. It is also fea tured in Clint Eastwood’s latest Dirty Harry movie, The Dead pool. After more than IO months on the Billboard chart, Appetite For Destruction finally broke into the top 100. Soon after the album shot to the top where it remained for three straight weeks. It has now sold over five-and-a- half million-copies and Guns ‘N’ Roses has become only the fourth hard-metal band to also top Billboards’ single chart with Sweet Child O’Mine. Slash, Izzy, Duff and Axl have, been in and out of bands since age 14 (about 10 years ago). Guns ‘N ‘ Roses new album will consist of four tracks from Live?! Like A Suicide – their 1986 EP and four new acoustic songs including I Used To Love Her, But I Had To Kill Her – the title of which is bound to stir up controversy. Izzy says “we don’t really care if people think we have a bad attitude. We’re the only band to have come out of LA recently that’s real. And the kid knows it. Hamilton band Johnny and The Phantoms will headline a concert at Skateworld on Friday night. The “all-age rage”, which in cludes performs Graham Brazier and Sonny Day, is to raise funds for street kids. The Phantoms, who hope to record their debut single early next year, have been together – albeit 51 line-up changes- for three years. The current line – up is frontman Ray Stroud who says “there are two types of music, blues and rubbish”. On rhythm guitar and keyboards is John Stroud, who also writes the band’s original material. Drummer is Les Beale and bass player Ray Chaber. The Phantoms have been resident at Highlights Lounge (Ziggy’s R & B Club) which they formed, for the past 12 months. The band performs original material early 60s British R & B.